A couple of weeks ago we had our final Skype call this year with our quad blogging action research team to pull together the lessons learned from having 4 classes of students from schools around the world interact with each other using blogging. As teachers we were inquiring into the impact of using blogging as a tool to improve writing. The gut feeling from us all seems to be that quad blogging has led to a dramatic improvement in some students' writing - students have stepped up and put a lot more effort into their writing as a result of producing authentic blog posts for a specific audience. Does quad blogging take more time? For teachers who have been following along with our journey, who are perhaps thinking of getting involved in quad blogging themselves, one of the most common questions we've been asked has been about finding the time to fit the blogging in. The reality for us was that time was no problem at all. This was not something added onto the curriculum, it was not an "extra" that meant time was being lost from "covering" something else. The reading of the buddy blogs was done both in class during the reading lessons and sometimes as homework - time was allocated for students to read through the blogs of their buddies and to think about how to write quality comments in response. Students could go on to read blog posts from other students in the buddy classes if they had more time. Quad blogging was also something that fitted in with what was already being done in the writing lessons: in our 4th Grade the current writing unit was about the writing process so it involved students learning about how to plan and draft - the only difference was that this was not on a piece of paper but online. The writing lessons in class were used by students to add comment and to make new posts. How did we assess the quality of writing? In order to know if students were improving their writing we had to first know their starting point. In the week before the quad started, students were asked to self-assess a comment they had already written on a blog post and the class teacher was asked to assess a post students had made on his or her own blog/ePortfolio. We used two rubrics for these assessments - one for writing and one for commenting - and the same rubrics for all 4 classes involved in the quad. These rubrics were also used at the end of the process by the students and by myself to see how accurately the students were able to self-assess their progress. One of the things we discussed today was that the rubrics we used with our students contained language that was more suitable to middle school students and to native English speakers. Our 4th graders all needed to have the rubrics explained to them and to see examples of what good quality writing looks like. Our ESL students needed to have a new rubric made for them that focused on just one thing in each section of the rubric. We discussed whether we should make a new rubric to use with our students in future. However we felt that the rubrics were very useful for students who wanted to self-extend. They were posted on the class blog for all to refer to when writing posts and comments. How did students choose whose posts to comment on? In the first week, each of our students was allocated a buddy in ISB. They did not know these students at all and so simply read the blogs and wrote their comments. In the second week the class at ISP that was the focus of the quad was a class that students had already been in contact with before. Students "knew" some of the students in that class and therefore wanted to choose whose blog to read. During that week they also wrote a post on their own blogs that had been inspired by what they had read. In the third week it was our turn to receive the comments. I noticed that students felt quite an attachment to the students who left comments for them. We asked our students to reply to these comments and some even chose to write an additional blog post as they were inspired by the comments they had received and wanted to give those students more information. By the final week of the quad the students had already received many comments on their writing. They had read and responded to these comments and had very definite ideas about whose blogs they wanted to read and respond to. Some students naturally wanted to comment on the blogs of the students who had comments on theirs. Knowing that they were reading and commenting on students who had already read their own work was a powerful motivator for students in the final week of the quad. How did students choose which posts to comment on? One thing that came across very clearly was that students could only write quality comments on posts that contained quality writing. Sometimes the students went back several weeks to find a post that their buddy had written that they felt they connected with and wanted to comment on. Sometimes students with extra time chose other students that they did not already know and read their blogs and wrote even more comments. How did students react to the comments on their posts? Students reacted very positively to the comments made. They appreciated the time and care that other students had put into this. Some students were very pleased to receive constructive criticism as they realized this would help them to improve in future. In some cases I found students to be more accepting of criticism from their peers than they would have been from a teacher. Earlier this year our students had studied a unit of inquiry about belief systems and had made presentations as part of their summative assessment. The students from MJGDS, who visited the published presentations, were able to give our students a lot more information about the Jewish religion. Did quad blogging help the students become better writers? Looking at the screenshots below you can see a typical example of how quad blogging has led to more quality comments. In the pre-quad comment there is some attempt to connect with the author of the blog post and to ask her a question, however just a couple of weeks later the same student has been able to write a proper greeting and ending, has been able to make personal connections with the post, and has been able to ask questions and encourage the student to visit her own blog to continue the dialogue. The work is organized into paragraphs and contains a lot more writing and is more in-depth. Did the technical skills of the students improve as well as their writing? During the week that it was our turn to blog, our students added a lot of multimedia files to their blogs. This is because the unit of inquiry they were studying at the time was How We Express Ourselves and the students had been involved in taking still photography, making music and performing a drama. The students chose themselves what they wanted to add, and I showed them how to do it. Since all students are using Posterous for their blogs, adding media is very easy both via email and via the web. What support do class teachers need? The teacher who was involved in the quad at our school is very tech-savvy and had already set up a thriving class blog this school year. He'd also involved his class in a round of quad blogging earlier in the school year. When I discussed with him how best an IT facilitator could support homeroom teachers who were not so confident he remarked that the biggest help was on the technical side: uploading posts, learning how to make QR codes, showing students how to add hyperlinks and how to create powerful multimedia to add to their blogs. We felt that with teachers who were less confident with technology, the coach should encourage these teachers to learn how to do things along with the students. As the students are learning how to add a video to their own blog, for example, the class teacher could be learning how to add a movie onto the class blog. We discussed how the role of the class teacher was pivotal in making this project a success - everyone must be committed in order for it to work and benefit all the students. The reason for our success was that we trusted that each of us would do our part and that the homeroom teachers that we worked with would take the time to conference with the individual students on their writing. All the teachers and tech coaches involved in this process believe that quad blogging has been an enormous catalyst for improvement in student writing. One of the reasons we are convinced that it was such a success is because of the commitment and dedication of the homeroom teachers involved. We realized that we were chosen for this group because of our own commitment as tech coaches and that we in turn chose teachers who we knew would step-up to the challenge and be responsible for the success of the project. Overall we felt that it was an extremely worthwhile thing to do, considering the impact on student writing in just 4 weeks. We also realized that commenting on the blog posts is the key to success. Students are keen and enthusiastic to put effort into their writing when they know that someone is reading it. They are prepared to put time and effort into writing comments when they get replies to their comments. We discussed how we could involve the wider school community in this - for example perhaps older students could also be encouraged to comment on primary student blogs, and perhaps we as coaches could run parent tech sessions so that parents and grandparents could also add quality comments to the blogs. We also discussed that students might be keen to carry on quad blogging at different times of the year with their same buddies. We decided that next year we will try to do 2 rounds of quad blogging, one in October and one in April, to see whether this can have even more impact on student writing. As I'm moving to a new school I'll need to get that organized right at the start of the school year. The students who appear in this post do so with the enthusiastic support of their parents. Wow! Thanks for this Maggie! I am really keen to try this next year with my fifth graders and was about to email you as I knew you had been facilitating this within your school. You raise some great points and ideas to consider. Thanks for sharing! I have to totally agree with you - the students love the idea of having comments left on their blogposts and race into the room daily to get to check their blog as fast as they can! We have had one awesome experience with quadblogging and have now decided to start quads in our own school to intentionally teach the skills of commenting and questioning on blogs. We are then hoping we can get the whole school in international quads by the end of the year - imagine that! Thanks so much for sharing in such detail what a positive impact this experience has had on your children. 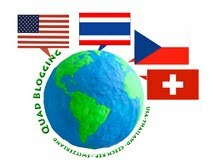 We are going to get involved in quad blogging, this post helped me a lot to clarify my thoughts. I was wondering what sort of rubric did you use for the class for writing on the blog? I love the idea of the trial. Our school is giving iPads to our students next year and this could be a trial we could do with these resources. It would be great to see if the iPads and blogging encourage our students to think about their writing. What year level did you trial with? And were all the students involved from the same year level? Thank you for sharing! In retrospect we thought the rubrics were too complex for many of the students, in particular the students who are in the ESL programme. Our students were Grade 4. The students in Prague were Grade 3, in Florida they were Grade 4 and in Bangkok they were Grade 5. This combination of different grades worked very well. I find that blogging really encourages writing and connecting as well. The friendships that develop through these exchanges are meaningful to children (and teachers) and are motivating. I'm a big believer in teaching children how to participate in online communities and that includes explicitly teaching them how to comment and helping them set high standards for their writing. This year, I had the highest number of students meet or exceed the writing standards at my grade level. I attribute the success to regular practice with authentic writing. Good luck at your new school and have a great summer!